Hogs, cattle, corn, soybeans. In Eastern Iowa, it’s hard to go a day without seeing (or smelling) one of the aforementioned farm features, and in our position, we provide service for farms in all these capacities. Many of the farmers we serve face tough decisions each day about how to make their operations more effective and efficient, and one of the best options we offer is the installation of solar panels. Help with Installation Costs: though the up-front cost of installation varies case-by-case, incentives from the federal government, Iowa state energy tax credits, and even local electricity cooperatives help ease the initial investment. In addition, Iowa offers opportunities to EARN money from your solar panels. Savings on your Monthly Bill: by generating and converting your own energy, you purchase less electricity from your provider, and in some cases sell unused energy back to the grid. 3. Reduce your Carbon Footprint: As a renewable energy source, solar energy is less harmful to the environment than traditional methods of electricity production such as fossil-fuel burning. This not only reduces impact on local ecosystems, but on the trend of Global Warming. In 2017, a farmer from the Eastern Iowa community of Cascade, did some research on the agricultural benefits of solar electricity, and called McAllister Electrical Services to begin the process of installing solar fields at two of his farms. To start the process, Pete McAllister met with the farmer to discuss energy needs and goals. They visited each of the two farms to determine the best location for each of the solar fields taking into consideration both area needed for installation as well as exposure for maximum sunlight. Pete also looked over each farms’ electric bills from the previous year to establish a monthly average of kiloWatt hours used. By calculating this average, Pete could determine the type of solar cell/panel needed at each location, and the number of panels necessary for the job. Once this preliminary information was gathered, Pete could go to the local electricity utilities (Maquoketa Valley REC and Alliant Energy) to seek site approval and work through policies and procedures to get on the power grid. Once the planning and paperwork was completed, it was time to begin installation. 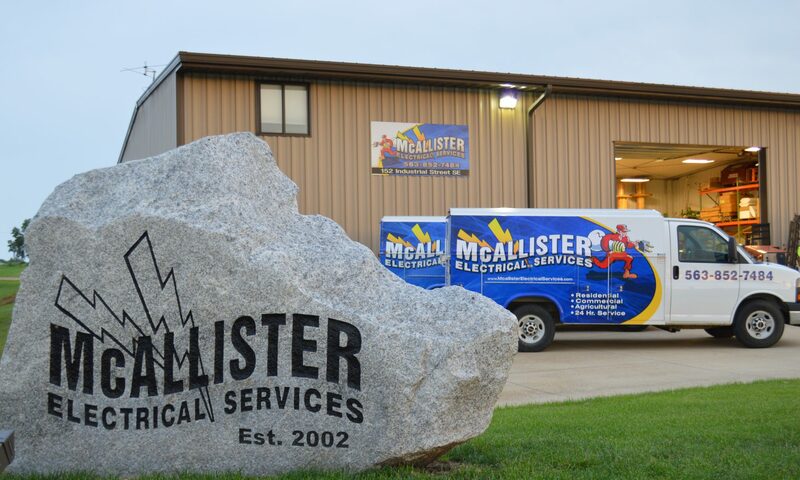 Plans were set, parts were ordered, and the guys of the McAllister Electrical Services crew went to work. In just a few short weeks, the guys had located underground lines on the property to avoid interrupting any service, installed the framework necessary to hold the panels, set the panels in place, and wired everything together to start electricity production. Before the system could connect to the grid, representatives from the local power companies needed to check and approve the site to ensure proper function and code adherence. For more detailed information and tips for planning your own solar panel installation, read more at the Iowa Energy Center website or calculate the costs for you own property by using the ISU Extension cost calculator.